We live in a world that’s powered by technology. Nowadays, it seems that everything is “smart”: smart TVs, smart assistants (aka, echo dots), smartphones, smart cars… About a decade ago, one would think that smart cities were just a dream in a faraway future, with those Dragon Ball-like flying cars and — who knows — teletransportation. Clearly, we’re not there yet, but smart cities are already a reality. As we move towards the cities of the future, governments, organizations, and even citizens are becoming more environmentally conscious. When it comes to transportation — the inseparable friend of urban pollution — it’s curious to see that while we’re using technologies to create the next generation car, there is also an environmental care to reduce the emissions and air pollution. As an answer to this dilemma, a new entity started to emerge: Mobility as a Service, better known as MaaS. In a nutshell, MaaS is the shift from personal-owned models of transportation to mobility solutions that are consumed as a service. This includes a multitude of players, like public transport operators, vehicle sharing companies, from cars and motorbikes to bicycles, parking operators, road infrastructure operators, to give some examples. - Gas emission: the reduction of gas emission is a natural consequence because there would be fewer fuel-moved transports. In addition to all this, MaaS also reduces the costs to the user. Instead of having constant and high expenses, as it happens to car owners, the user has several payment methods that he or she can choose from depending on its needs, such as a monthly subscription or pay-as-you-go. Considering the new social and business reality, Brisa’s innovation department, A-to-Be knew it had to be able to respond to the new transport market. Given the complexity of MaaS and all the entities involved, A-to-Be understood that the providers of these type of solutions have to rely on broad partnership networks. And so, Brisa’s innovation department developed a technological solution called A-to-Be MoveBeyond™ for the MaaS providers. 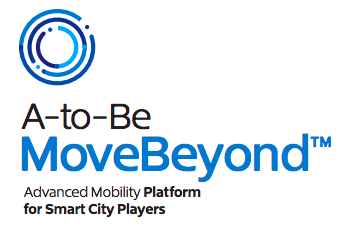 Public transport operators, vehicle sharing companies, parking operators, road infrastructure operators, gas stations, tunnels, highways can take advantage of MoveBeyond. This digital platform allows the MaaS provider to integrate all user services in a single solution with a straightforward payment method. At the same time, it provides to the operator better data on the users’ profiles and allows the issuing of digital tickets and bills. In other words, MoveBeyond is a back-office solution that integrates all the information related to the use of MaaS services allowing the users to access through a single account. With the importance of smartphones nowadays, A-to-Be knew that this solution needed to be more than just web responsive; it was critical that users could access it also through their mobile phones. The problem was delivering just a functional mobile app wasn’t enough. The solution needed to be intuitive so that the user could easily adapt to it, but beautiful at the same time. Why was the user experience so important? MaaS solutions have a really strong customer-centric component. They need to be created having in mind the end-user — which, in this type of solutions is usually the consumer. Now, picture the following scenario: you’re a customer of MaaS provider; imagine some Uber-like company. You’ve just ordered a car using the mobile app. It seems pretty easy to use. The app automatically asks you where you want to go, and shows you the available cars near you, how much it’ll take the driver to arrive, and the estimated cost of your trip. It’s intuitive, has a nice interface, and everything worked perfectly. Now, picture a second scenario. The same business concept; and you’ve just ordered a car. The app design looks kind of shady and it’s confusing. You’re not sure where you can add your address, it doesn’t say how much time it’ll take for you to get home, or how much you’ll pay. But just like the first scenario, you safely arrived at your destiny and you even pay less. Which app do you think it’s more likely for you suggest to a friend? Probably the first one because you had a better experience overall. That’s the power of user experience. It’s more than having a pretty app; it’s about having a functional while intuitive app. User experience improves the way users interact with your websites, apps’ and devices. And the quality of this experience is a deciding factor for your clients to complete transactions and recommend your product and brand. It’s also about coherent concepts, consistent workflows, and reliable performances. That’s why A-to-Be reached out to Hi. After understanding the needs and users of A-to-Be solution, we gathered a UX/UI design thinking team to help the company transform MoveBeyond into an intuitive and user-friendly solution, and thus improving the user adoption. At Hi, we’re focused on matching business requirements with users’ needs, by designing interfaces that are intuitive and easy to use. Our UX services include user research and usability tests to help you improve your digital presence. Check out what we’ve been up to with A-to-Be. Are you looking to transform your users’ experience? Let’s talk!